Tripp Lite SU8000RT3UG 8000VA / 8kVA / 7200 watt online, double-conversion UPS system offers complete power protection for critical network applications. This system delivers online, double-conversion UPS protection with zero transfer time, suitable for advanced networking applications. Fault-tolerant auto-bypass prevents unexpected service interruptions during UPS overload or internal fault conditions. Included detachable PDU with manual bypass switch enables hot-swappable replacement of entire UPS power module with no interruption to connected equipment. 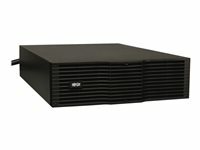 Enhanced availability, fault tolerance and simple hot-swap replacement options make this UPS ideal for advanced networking applications in data centers, computer rooms, network closets and rugged industrial locations. BP240V10RT3U rack/tower external battery pack offers extended battery runtime when used in conjunction with expandable 240V Tripp Lite rackmount and tower UPS systems. Includes heavy gauge cabling with high current DC connector for safe, simple installation. Included daisychain connector enables the connection of additional compatible 240V external battery packs to the host UPS. Included mounting accessories support 3U rackmount installation in 4 post racks. Options for 2 post center-mounting and upright tower installation available. and other Tripp Lite UPS systems that specify the use of this battery pack. 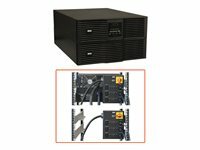 Tripp Lite SU6000RT4UHVG 6000VA / 6kVA / 5400 watt on-line, double-conversion UPS system offers complete power protection for critical server, network and telecommunications equipment in a single 4U rack/tower compatible housing. Full-time active power conditioning provides clean, continuous dual-conversion AC output free of voltage fluctuations, power interruptions and line noise. Fault-tolerant auto-bypass prevents unexpected service interruptions during UPS overload or internal fault conditions. Detachable back panel PDU with manual bypass switch supports hot-swappable whole UPS replacement with no interruption to connected equipment. Single all-in-one rack / tower housing installs in only 4 rack spaces (4U) with a maximum installed depth of only 20.7 in. / 52.6cm. Maintains full-time sine wave output within 2% of selectable 200/208/220/230/240V nominal during brownouts as low 100V and overvoltages as high as 300V. Expandable runtime is supported with optional BP192V12-3U external battery packs. Battery independent restart ensures automatic UPS power-up without user interaction after lengthy power outages, even when batteries are expired and require replacement. Double-conversion operation converts raw input from AC to DC, then re-synthesizes output power back to perfect sine wave AC with enhanced protection from harmonic distortion, fast electrical impulses and other hard-to-solve power problems not addressed by other UPS types. Highly efficient operation in optional economy mode significantly reduces BTU heat output and operating energy costs. Network-grade AC surge and noise suppression. Supports detailed monitoring of equipment load levels, self-test data and utility power conditions via built-in RS-232 and USB interfaces. Optional network management card options available. HID-compliant USB interface enables integration with built-in power management and auto shutdown features of Windows and Mac OS X. PowerAlert monitoring software offers detailed site power and UPS updates with support for safe auto-shutdown of connected systems as UPS batteries become depleted. Supports Emergency Power Off (EPO) via built-in interface. Front panel LEDs and LCD readout with scroll controls support front-panel visual monitoring of all major UPS for a variety of control options to support advanced UPS settings and configurations. LED / LCD display panel rotates for viewing in rackmount or tower configurations. Hardwire input and 4 C19 outlets. Support for optional North American and International cordsets. External battery packs are field replaceable and hot swappable.